"Anime: My anti-drug. Because when you're addicted to anime, you can't afford no drugs." Q: Can you summarize anime in three words? The Anime Man: Pantsu, Plot, Justice. The term anime is derived from French "dessin animé" for cartoon drawing, and "l'animation"; it was then adapted to Japanese, short for "animeshon", the Japanese pronunciation of the word "animation". This is because, before the Americans, the French were more familiar with Japanese cartoons and manga and for a time were Japan's primary consumer. Of course, once this art-form carried over the Atlantic, the rest was history. It may come as a surprise that the classic anime "style" is in fact lifted from American animation. 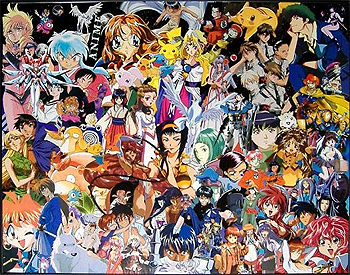 Anime's trademark visual style is shared with Manga (Japanese comic books and graphic novels); in both cases, it is inherited from the post-World War II work of Osamu Tezuka, who is arguably the father of modern Japanese commercial art. Tezuka was strongly influenced by the work of Walt Disney, and adapted the Disney style to Japanese sensibilities. (Other sources say the greatest influence was actually Betty Boop, who was one of Tezuka's favorite characters.) Subsequent creators of graphic works copied his style, resulting in the familiar "large eyes" look that characterized anime and manga for so many decades since the 1950s. (On this topic, fellow artist/author Shirow Masamune has said, "I've heard that some people complain about the large eyes and small noses and mouths in Japanese manga. But I don't see a whole lot of difference when I look at Disney characters.") Tezuka's work essentially created both manga and anime as they are known today. His seminal creation -- and the one most Americans are likely to be familiar with -- was Tetsuwan Atom (Mighty Atom). It's perhaps better known in the English-speaking world as Astro Boy. Note that the creator of Astro Boy remarked that the Japanese wanted to be blonde and blue-eyed. This is the best evidence of the reverse of what is happening today: the Japanese liked the drawings of Walt Disney (of humans) because of the American looking people, and the Japanese fascination with American culture of the time. It's important to note that the western definition of "anime" differs from the Japanese definition. As suggested in the paragraph above, "anime" is really not a style but a term. In Japan, it refers to all animation, whether it's eastern or western, cel or CG. Thus, you may see Disney movies filed under "Anime" on a Japanese website, such as Amazon.co.jp. It's only outside of Japan that "anime" strictly means "Japanese animation," while non-Japanese animation is called by the much more generic term "cartoons" or "animated features" or "Western animation". It's a recursive loanword, which naturally experienced this definition shift due to its redundancy with the original word. For some people, anime can be very addictive. Try not to fall in too quickly if you have a weak constitution. Some anime depend on Japanese culture for context, so try to learn actual facts about Japan to balance things out, and maybe even set goals to learn the Japanese language (But try not to become a know-it-all, either). This will make the anime experience better in the long run. Be careful though; falling too deep could turn you into an Otaku. The following 200 pages are in this category, out of 1,589 total. Bakusou Kyoudai Let's & Go!! This page was last edited on 22 January 2019, at 03:47.